Seed characters available this year include an owl, cat, squirrel, raccoon, penguin, and snowman! 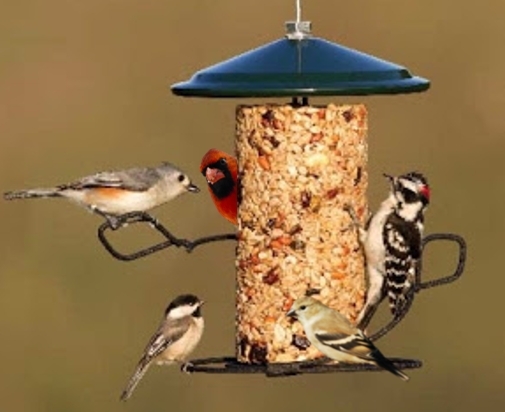 Seed cylinders have become Wild Birds Unlimited's most popular "winter feeder". Just slip the cylinder of your choice on the feeder and watch the birds. No more daily walks in the cold if you don't feel up to it. No more feeling guilty about having empty feeders when you go to visit relatives during the holidays. Seed cylinders last a long time, weeks if not months in some yards. And they are a perfect gift to anyone that loves nature! 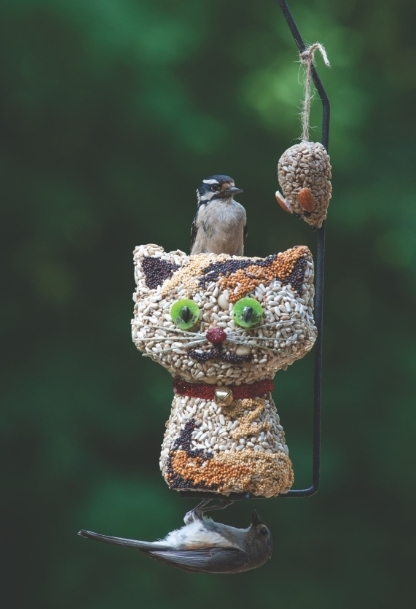 Clinging birds like the finches, chickadees, nuthatches, and woodpeckers flock to the food and don't have to wait in line to find a perch. Cylinders are couple pounds of quality high-fat seeds, nuts, and fruit tightly packed and held together with gelatin. Birds can choose a any spot to eat around the cylinder and seed can't be scattered to the ground to sprout or attract unwanted critters. Wild Birds Unlimited East Lansing, MI also has a large selection of Hot Pepper Seed Cylinders! Birds don't sense hot because they have so few taste buds. So serving foods that birds like, that is coated in hot pepper, doesn't stop birds but does deter squirrels, raccoons, and deer from lunch at the "bird" feeder. In addition to seed blocks and seed cylinders there are also Seed Bells, Giant Pinecones dipped in seed, Seed Wreaths, Bird Seed Houses, and the most unique Bird Seed Characters (found only at Wild Birds Unlimited). These products are all handmade in the USA using the the highest quality fruits, seeds, and nuts that attract the widest variety of birds. I marvel at all the detail that goes in to each seed character! FYI, don't wait if you see something you like. Things are moving out of the store much faster than anticipated. Seed cylinders are available year-round but when the characters and other seasonal goodies are gone, they won't be back until next October.